Do you know that a single viral blog post can make your website a hot property and create buzz around your personal or business brand very quickly. So what makes a post go viral? Let’s dissect some recent posts that captured readers’ attention and attracted loads of social media shares. Here a some examples and lessons from blog posts that went viral. Uplifting content gets shared more than you may believe. Practical advice that can help improve life skills is always in demand. There are countless posts that hand out tips on leading a happier and more fulfilling life. Some do it better than others and make readers care enough to share. 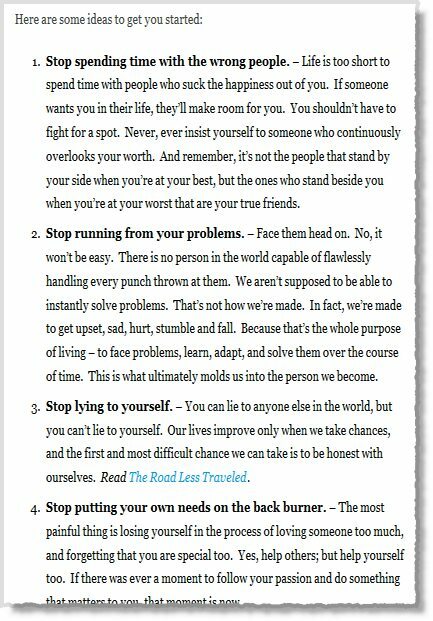 I discovered “30 Things to Stop Doing to Yourself’” by Marc Chernoff first on StumbleUpon. The post has garnered over half a million likes, over 20,000 tweets and thousands of shares on other social media. A post’s headline is a key viral driver. Unless it motivates readers’ enough, it won’t get clicks no matter how great your content may actually be. Negative headlines have been seen to convert better than positive titles. Readers can be skeptical of positive superlatives like ‘best’ and ‘most’, perceiving them to be cliché or an attempt at endorsement, and view negative ones like ‘worst’ or ‘never’ to be authentic and impartial. In this post, use of the negative word ‘stop’ makes readers pause and wonder if there’s something they’re doing that they shouldn’t. 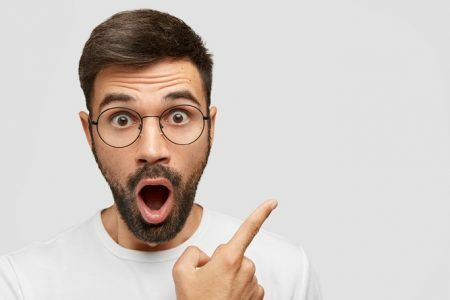 Time and again, studies and split-tests have shown that headlines containing numbered lists attract massive click-throughs. Online readers get put off by chunky paragraphs and scarce use of bold and italicized font. 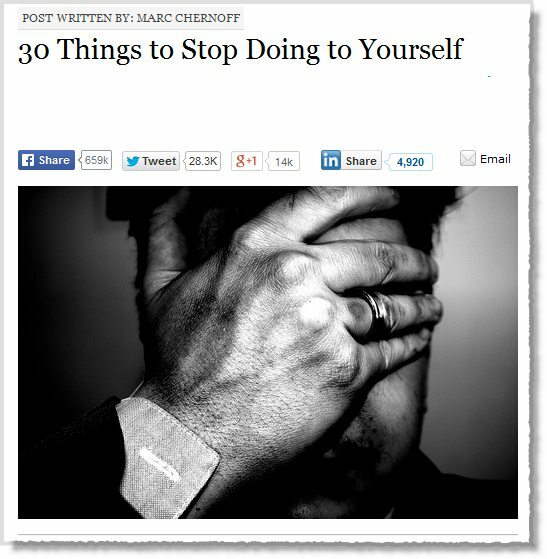 “30 Things to Stop Doing to Yourself“’ presents 30 points in numbered list with no more than four lines under each. It’s easy to read and digest. The post offers readers actionable advice that can be incorporated right away. Every tip tells you what to stop doing and what positive action to take. Some also have links to books on a similar topic for further reading. A well-told first personal account of an experience and lessons learnt thereof adds authenticity and makes for an interesting read. 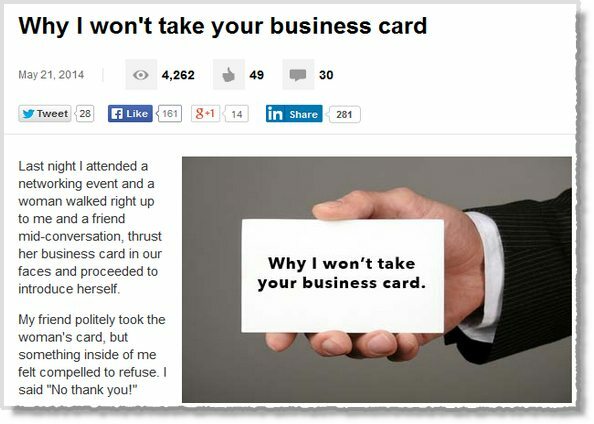 Consider a recent LinkedIn post ‘Why I won’t take your business card’ that was shared 281 times and elicited several comments and opinions (some from the top 1% of most viewed profiles on the network). 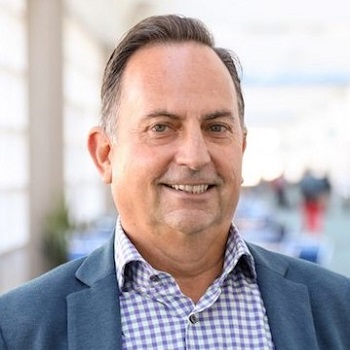 The post discusses the importance of building relationships over making an explicit sale at networking events through the lens of a marketing strategist who found herself in a similar situation. While the honest narrative is compelling enough to encourage responses, the author ends her post by asking questions and soliciting comments. A simple “do you think……” or “I would love to hear your opinion on……” at the end of your blog post can nudge readers into leaving a comment. 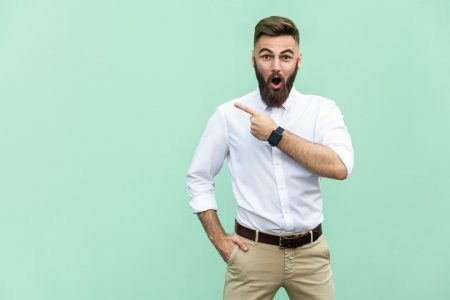 Even one or two comments encourage more people to comment, which in large part, can be attributed to the psychological phenomenon known as ‘social proof’, where we are influenced by and conform to others’ actions. 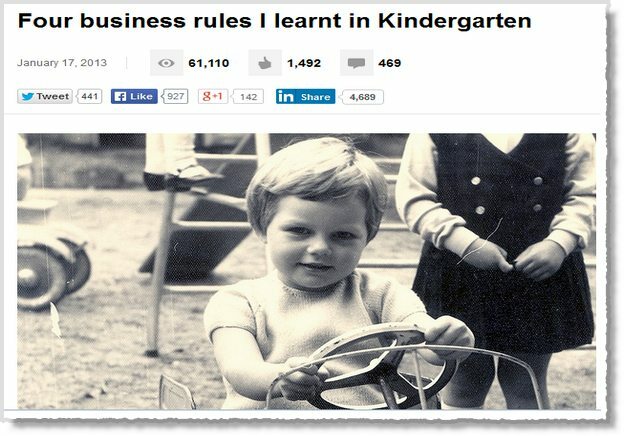 Another hugely shared (4,685 times on LinkedIn) post ‘Four Business Rules I Learnt in Kindergarten’ is an example of the author’s creative and playful approach to discussing a serious business topic. Attracting over 400 comments, the post struck a chord with readers for delivering simple yet valuable lessons we sometimes tend to oversee. A black and white photograph accompanying the post gives it a warm picture book feel, and really sets it apart from other LinkedIn posts. 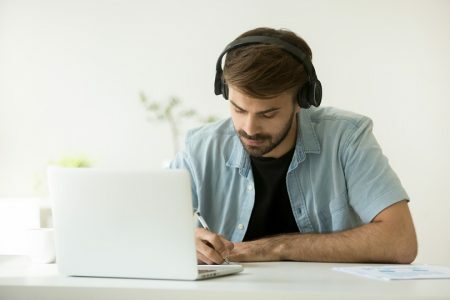 Explore ways to deliver useful content without sounding like thousands of other posts doling out tips and advice on the same topic. A great example is ‘Marriage Isn’t for You’, which not only managed 10,000+ shares on Twitter and Facebook, but also landed the writer a book deal. The interesting headline that instantly incites curiosity. There’s also more to the headline than meets the eye (a clever move by the writer), which lifts the value of the post. A refreshing and heart-warming take on marriage. Check out the post here. Say you’re giving financial advice to entrepreneurs. A title such as ‘Here’s Why You Can’t be the Next Millionaire’ is a more intriguing title than ‘How to be a Millionaire’, which is pretty standard stuff for blogs in your niche. Instead of saying what you should do to set the cash registers ringing, you can explain what you may be doing now that’s keeping you from being the next millionaire. 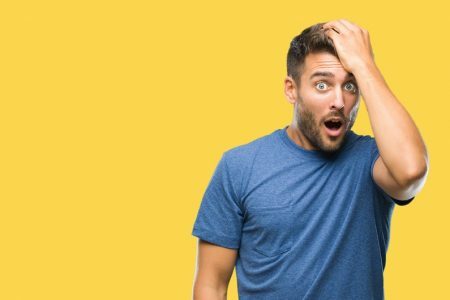 ‘A Little Mistake that Cost me $7000 a Year’ is another click-worthy title and an interesting lesson on preventing financial mistakes. If your title is a click-magnet, make sure your content sustains the curiosity created by it. Also remember that it may not be possible to drum up a captivating, click-worthy title for every post. Readers tend to get behind blog posts surrounding buzzing news and major events they’re exposed to on news sites, in the papers and on their social media pages. 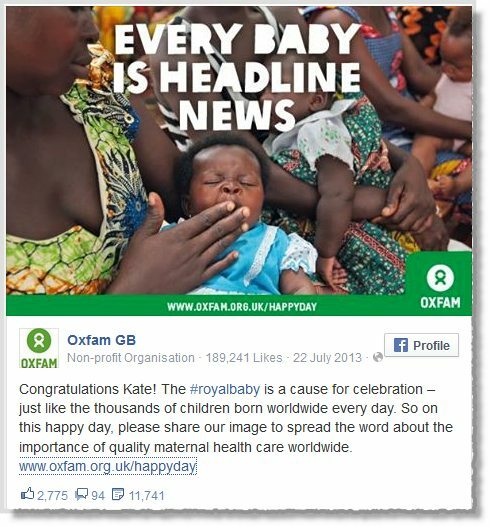 Oxfam GB timed their blog post on maternal health around the birth of Prince George, a hugely popular event that took the web by storm. The charity organization used Facebook to draw attention to their blog post and delivered the important message that every baby’s arrival into the world is a cause for celebration. Use Google Trends, BuzzFeed, Twitter, Digg, StumbleUpon and Reddit to stay on the pulse of trending news items. Explore possible ways of relating news stories to your niche. Lessons, opinions, potential consequences : there are many ways in which you can use viral news to grab readers’ attention and encourage shares. Blog posts with useful content keep readers coming back for more. You must keep posting new content on questions people are asking, topics they’re searching for, and discussions they’re having online. It continuously supply blog post ideas. You’re sure to find issues and topics that may have escaped your radar. Don’t worry about the spelling, grammar and style of forum posts, they are bound to be very casual. Focus on what people want to know about and the kind of problems to which they’re soliciting advice from fellow forum members. Identification of forum members occurs through user names and some forums also allow guests to comment. Naturally, discussions are honest and open. This gives you a chance to really get into people’s minds and understand their needs, problems, interests, fears and lifestyles. For a quick forum search, type: allintitle: ‘keyword’ forum. 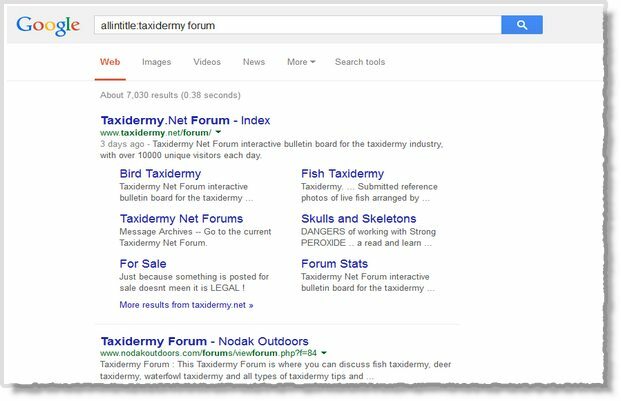 If you’re a taxidermist, you can access over 7,000 relevant results as shown below. It is an authoritative and popular Q&A social media site that can help you zero in on winning blog post ideas. 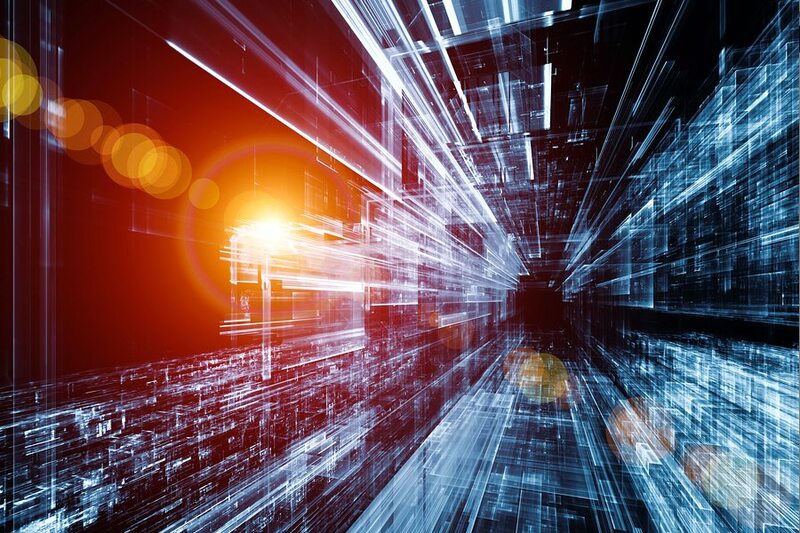 Its early adopters were technology pundits, marketing gurus and entrepreneurs. As such, the content quality and credibility of the site ranks highly. 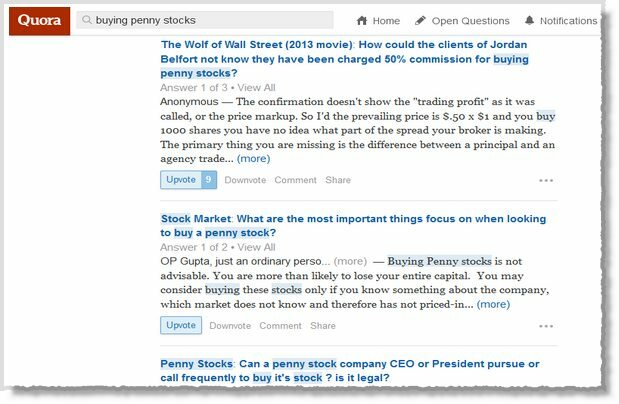 You can type a keyword to see questions related to your topic. 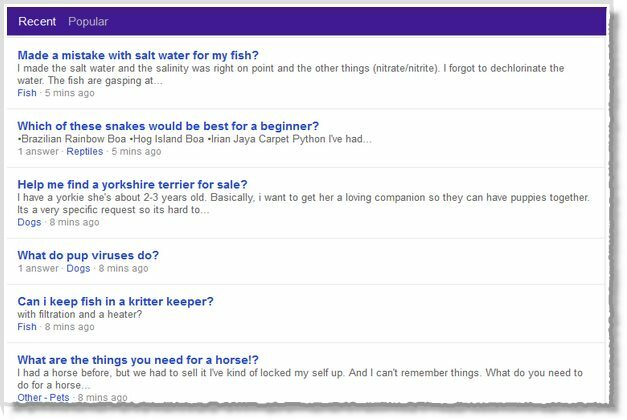 You can also test if potential blog topics may generate interest and response from readers by posting questions and seeing if they’re answered. It is another community-powered Q&A site covering 25 categories. You will not find as high a number of intellectually curious and elite members on the site in comparison to Quora. There is, however, no dearth of opinions, musings and personal experiences, which can spark off interesting blog post ideas. Here are a few more tips to make your content move and be shared. Submit to Reddit, Digg, Delicious and StumbleUpon. What about you? What content and headlines have you found to work? Look forward to your insights in the comments below. Guest Author: Jessica Davis is a Content Strategist at Godot Media – a leading content marketing firms. She has years of experience helping businesses and individuals succeed through the use of great content. She also writes extensively on technology and social media related topics.